It is in our human nature to “be in the know” of everything around us. This helps us look special and smart. When we feel that we are missing out on trends and benefits we suffer through the FOMO i.e. ‘Fear of Missing Out’. As marketers, this presents an opportunity to leverage the fear of audience to get them to purchase. This is not even a new advice. For years marketers and sales reps have been using limited time offer, flash sales, and discounts to make a sale. In this blog, I will give you some unexpected insights into this technique to help you better understand your customer’s psychology. Though the word FOMO was added to the Oxford dictionary in 2013, the concept is existent for a long time. In the early ages, not being updated about new food and water sources could mean the difference between life and death of a person. Over years, this fear has been hard-wired in our brains. Now in the digital age, we fear missing out on trends, ideas, goodies, etc. In fact, a major factor backing the popularity of social media is our fear of missing out on the latest updates. According to a research by MyLife, 56 percent social media users are afraid of missing information like an event, news, or an important status update if they don’t remain active on social networks. Flash sales are the most common example of FOMO campaign. A flash sale naturally creates urgency because of limited stock and/or limited time frame. This creates a sense of scarcity of the product and boosts the conversions. It is commonly used by retailers both online and offline. For example, end of season sales, Black Friday sales, festival offers, etc. Event organizers capitalize on FOMO by limiting the number of seats available, providing exclusive seats, and banking on the natural essence of any event i.e. the limited time available to buy tickets. These events are not only limited to music shows or conferences. Now businesses are marketing webinars and podcasts just like an event to gain an instant audience. User-generated content is a content marketing practice where you leverage your users to create content for your brand. In exchange for content, you can offer them social recognition or rewards. This approach works effectively when you have a lot of people engaging in a UGC campaign, it becomes a trend. Since many users avail the benefits, it creates a FOMO effect among people who don’t participate. When you have a highly engaged audience on any social media platform people from similar interest group start following you as well. The people with interests like that of your audience experience a fear of missing out if they don’t follow you. Hence a strong social media presence helps you increase the size of your audience. Loyalty programs are used to ensure long term retention of customers. By giving timely rewards to existing customers and occasional surprises, you create a FOMO affect among people who are not your customers. Thus, the fear of missing out on freebies brings in more and more people under your loyalty scheme. Is Anti-FOMO the new FOMO? 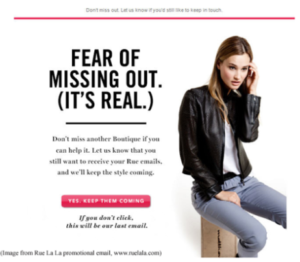 While the idea of instilling a fear to increase sales sounds interesting, it is not as good as it sounds. An MSI research by Ceren Hayran, Lalin Anik, and Zeynep Gürhan-Canli suggests that FOMO is not something we should be completely banking on. A customer is less likely to share the experience of a purchase made in this fear. They might choose not to repeat their purchases either. Fighting FOMO: In this, you help the users pacify FOMO by acting as and knowledge sharers. It includes techniques like content curation to let them stay in-the-know. Flipping FOMO: In this strategy brands take a step ahead from pacifying FOMO to wiping it off completely. This involves educating the customers about avoiding the fear. 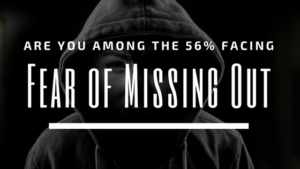 From all these research insights and expert opinions, it is obvious that helping customers get rid of their fear of missing out is the right approach to marketing. Interestingly, marketers are keen about the creative uses of this. With us, marketers (especially growth hackers) going nerdy about every new technique we hear about the only question is – Will using Anti-FOMO become the new FOMO among the markers?